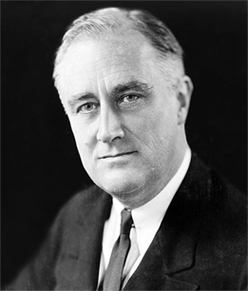 Franklin Delano Roosevelt began his first term as the 32nd President of the United States in 1933. That year, the White House received a record 40,000 Christmas cards from the American public; the number was so large that a staff had to be hired to handle the influx of mail. The Roosevelts sent Christmas cards to close family and friends. The card they ordered was single-sided and featured an etching of the White House, hand engraved by A.B. Tolly. That same year marked the 10th anniversary of the lighting of the National Christmas Tree. 5,000 people attended the ceremony, during which Roosevelt gave the longest speech to date. Roosevelt’s speech established the tradition of the president speaking directly to the American people during the tree lighting ceremony. In 1935, First Lady Eleanor Roosevelt purchased gifts for White House staff members from Val-Kill Industries, a workshop she established with several lady friends to help low-income families supplement earnings by crafting furniture and metalware. She bought 170 pewter matchbox covers crafted from The Forge, a division of Val-Kill that specialized in the art of metal craft. A seal of President Roosevelt’s profile was welded onto the front of each matchbox cover and engraved with his initials. Each pewter gift was accompanied by a single-sided Christmas card that featured a photograph of the President and First Lady. The White House that year received over 6,000 Christmas cards, and the Roosevelts sent out 400 Christmas cards to family and friends. The following year, the First Lady again purchased metal gifts from The Forge for the White House staff. She ordered 200 pewter paper knives, each one imprinted with a copy of the official Presidential seal. She also ordered 600 single-sided Christmas cards to send to family, friends, and associates. The card design featured a lithograph of a bucolic red farmhouse and barn flanked by two evergreen trees. At the National Christmas Tree lighting ceremony, 3,000 people were present to hear FDR’s annual speech, in which he discussed Charles Dickens’ A Christmas Carol and Scrooge’s renewed sense of self from the lessons he learned. With the reforms set into motion from the President’s First New Deal, the economy was on an up swing for the first time since the onset of the depression years. In 1937, The President and First Lady ordered 175 pewter desk pads from The Forge to be given to White House office staff members. They also ordered 600 of the same single-sided Christmas cards from the year prior and added an imprint of the year. With the holiday season being celebrated throughout the United States, peace in Europe and Asia was deteriorating. Japan had invaded China, and the Soviets provided military support to China, eliminating China’s alliance with Germany. In Europe, Germany and Italy were strengthening their military forces to invade several other European nations in following years. With the situation overseas so unsettled, the President delivered a speech to the American people at the Christmas tree lighting celebration themed around the importance of peace and forgiveness. For the 1938 holiday season, the President ordered 200 pewter paperweights from The Forge to be given to his office staff. The Roosevelts again ordered the same single-sided Christmas cards with the only change being the year. The situation overseas continued to worsen as the Japanese perpetuated their invasion of China. In Europe, the Annexation of Austria was led by the Nazi forces. Even with diminishing peace world-wide, Americans maintained a thorough and joyous celebration of the holiday season. Tensions overseas continued to augment with the onset of the following year. Nazi forces invaded Czechoslovakia and Poland, and Germany created an alliance with Italy. France and Great Britain also created an alliance and declared war on Germany while the Soviets signed an armistice with Japan and removed all military support from China. Through these turbulent times across the Atlantic and Pacific, the U.S. maintained a practice of laissez-faire politics, but Americans were beginning to wonder how much longer it would be until they were forced to intervene. 1939 marked the last time that FDR could order from The Forge, which was forced to close its doors due to a diminishing availability of raw materials. The President ordered 200 letter holders to give to his White House staff. For his cabinet members, he ordered ashtrays personalized with each member’s initials. For security purposes, the National Christmas Tree lighting ceremony was moved back to the Ellipse where there was more open space, enabling for greater protection of the President. The Ellipse could also accommodate the growing number of people that attended the event. A new 36-foot red cedar from Mount Vernon, George Washington’s Virginia estate, was designated the new National Christmas Tree for that year. Roosevelt ran for an unprecedented third term during the election of 1940. Promising to keep America out of the fighting overseas, he received 55% of the popular vote. With the closing of The Forge, FDR’s secretary ordered over 200 Scottish terrier key chains from Hammacher Schlemmer. The key chains were very near and dear to the Roosevelts, as the gifts immortalized their own beloved Scottish terrier, Fala. FDR’s secretary also ordered money clips and key chains from Cartier to be gifted to White House staff and associates. For his cabinet members and close associates, the President ordered 42 initialed desk pads. As in previous years, the single-sided Christmas cards remained the same except for the year engraftment. In 1941, the first year of Franklin Delano Roosevelt’s third term in office, the situation overseas became more tumultuous than ever. The Germans launched a surprise offensive on the Soviets while the Soviet and British armies united in a military alliance. Several weeks before Christmas, the Japanese attacked Pearl Harbor, prompting the United States, UK, and other allies to formally declare war on Japan. While American troops were preparing for war, the celebration of the Christmas season did not come to a halt. The President and First Lady gifted over 400 signed photographs of the couple at their home in Hyde Park, New York. To current and replaced cabinet members, heads of the executive office, family, and friends, the President gave bounded copies of his campaign speeches. Winston Churchill was a White House guest during Christmas of 1941. He attended the national tree lighting ceremony, which was moved from the Ellipse to the South Lawn. Two 25-foot live Oriental spruce trees were moved from other locations on the White House grounds and replanted within the South Lawn. The ceremony that year drew a crowd of over 20,000! Both Churchill and Roosevelt addressed the masses with Christmas messages, which were also broadcast world-wide via radio transmission. Now that America was officially at war, the Treasury Department began promoting and encouraging Americans to purchase defense bonds and stamps. Appropriate for the occasion, the Roosevelts’ Christmas gift to their White House staff was a black leather stamp album. A copy of the previous year’s Christmas speeches by Churchill and the President were given to cabinet members, heads of the executive office, family, and friends. After several years of sending the same Christmas cards, the single-sided design finally changed to a photograph of the President and First Lady sitting at a table on the White House grounds. The imprint on the card read: “WITH CHRISTMAS GREETINGS AND OUR BEST WISHES FOR A HAPPIER NEW YEAR, THE PRESIDENT AND MRS. ROOSEVELT”. The First Family decided to spend Christmas at their home in Hyde Park, New York. For their annual Christmas cards, the one-sided design contained a photograph taken of the executive couple at their Hyde Park home along with a simple holiday greeting. A book of the President’s three inaugural addresses was given to cabinet members, heads of the executive branch, family, and close friends. For the White House staff, the President ordered 300 magnifying glass paper weights. While neither the President nor the First Lady were present at the National Community Christmas Tree lighting ceremony, 15,000 people gathered on the South Lawn of the White House! From his home in Hyde Park, FDR delivered a 30 minutes Christmas message via radio transmission, which was also broadcasted to the American military stationed overseas. Throughout 1944, the Allied forced gained victories in many fronts throughout Europe. The same year would also be Franklin Delano Roosevelt’s last Christmas. On the evening of the invasion of Normandy, the President issued the D-Day prayer; a copy of the prayer was given to each member of the White House staff. For close friends, FDR has the prayer made into a slip cased limited edition book. The last Christmas cards that FDR sent out maintained the same single-sided design, featuring an etching of the White House and a holly leaf with the imprinted greeting: “With Christmas Greetings and our best wishes for a Happier Nineteen Forty-five, The President and Mrs. Roosevelt”. I never really thought of what presidents do during Christmas. I wonder who makes the cut to get one of their Christmas cards. The 1941 card did exist, and was sent with a dual-signed photo of FDR and Eleanor, primarily to White House staff and Secret Service. With the US at war in early December, the photo of the smiling couple was quickly deemed inappropriate and very few were sent outside FDR’s inner-circle. My great-uncle was a Secret Service agent to FDR and personally received one of the cards with photo – which I still own today.